intuVision VA White Label - your effortless solution for every application, under your own branding. intuVision's fully developed applications are available for quick turn-around white labeling with your product name and logo. We do all the work, converting our solution over to your chosen name, and you get a full fledged, ready to go solution that you can market and sell to your customers. intuVision LiTE is also available as a white labeled solution, allowing you to pair lightweight analytics with our world-class offering of reporting analytics add-ons, such as event graphing, search, and review, customizable object classification, scene heatmaps, and more! With our custom modules you only pay for features you use. These new modular packages offer wide range of events and maximum flexibility. Any of the four modules can be combined to provide the best solution that meets any requirement. To use a camera for customer counting during the day and doubling as a security camera at night, intuVision Security module can easily be added to the intuVision Retail module. Map view for at-a-glance understanding of camera interactions. Third party triggers to embed event information in various systems, including exacqVision, Milestone VMS, Cisco VSM, and Immix. Email notifications for various alarms to be instantly aware of high level events. Customer traffic information such counts, flow patterns, queues and dwell time provides invaluable business intelligence. intuVision Retail module can notify managers that there is a long queue at the check-out line, report daily customer counts, and generate heatmap data of commonly traveled paths through the store. With intuVision Retail intelligence data can be made available to other retail applications in place increasing all aspects of business efficiency. With a history of government projects and deployments, our analytics were originally developed for the security domain. intuVison Security can send an alarm directly to your Video Management System, or to your smart phone as an email. With many events to choose from a thief breaking into a doorway after hours, a person entering a one way door from the incorrect direction, or a vehicle loitering outside of your building, intuVision Security will notify the security staff of event occurrence. With intuVision VA Traffic, all you need is a camera and a computer for processing; no longer is it necessary to manually count vehicles in hours of video collected at intersections. While human counting is labor intensive, pressure hose counters are often inaccurate, and magnetic loop counters are expensive and not always feasible. intuVision Traffic is mobile solution can be moved from location to location to perform collection and analysis. The flexibility to process either real-time or archived footage, will guarantee the perfect solution for any project. For more information about our products, email us at sales@intuvisiontech.com or complete a product evaluation form. Video analytics is a computationally intensive process and requires powerful hardware for accuracy. intuVision VA overcomes this computational hurdle by utilizing graphics processors designed for the video gaming industry. Graphics cards contain powerful programmable coprocessors (GPUs) designed to process pixels in parallel, this provides great potential for acceleration of video analytics algorithms. All intuVision algorithms leverage GPU processing which results in lower hardware cost for deploying VA for any application. CPU/GPU processing time comparisons of sample parallel intuVision VA processes are shown in the table below for different frame resolutions. Below is an example of faster than real time processing using a GPU, allowing extremely fast post-processing of videos. One of the features which differentiates intuVision VA from other video analytics solutions is our robust classification. Available with all relevant event types in all intuVision VA Modules and intuVision LiTE, this allows you to dramatically hone in on the objects of interest. The default classification types included with intuVision VA are person and vehicle, and with the ability to add unlimited user defined classification types, we open this up to you. Whether you want to exclude animals such as deer or dogs, detect between cars, trucks and motorcycles, exclude customers with shopping carts from your counts, or any other use case, we provide the freedom to do so. While many similar "classifications" can be obtained by alarming only on objects of a certain shape or size, or objects that only move in a certain way, these characteristics will not provide the same confidence. In perspective views, where the objects in the far distance are smaller than those in the near, object classification is much more robust, not to mention it is easier to collect 5 training samples than to play with settings until you have a good description of what you are detecting. The classification is set up through a brief training, allowing you to take images directly from your camera and use them as examples, specifying exactly what each type should be defined as on that camera. The training takes only a few moments, and allows us to get good classification results on any camera view. Alarm only on vehicles to create a robust count without person detections included. Alarm only on people, excluding deer and other animals. Detect between vehicle types for more complete data. Detect between single people and groups for differentiated customer counts. Alarm only on people, and filter out false detections of doors or other moving objects. For nature or farming purposes, detect only specific animals of interest. In factories, detect incorrect items or residual material. 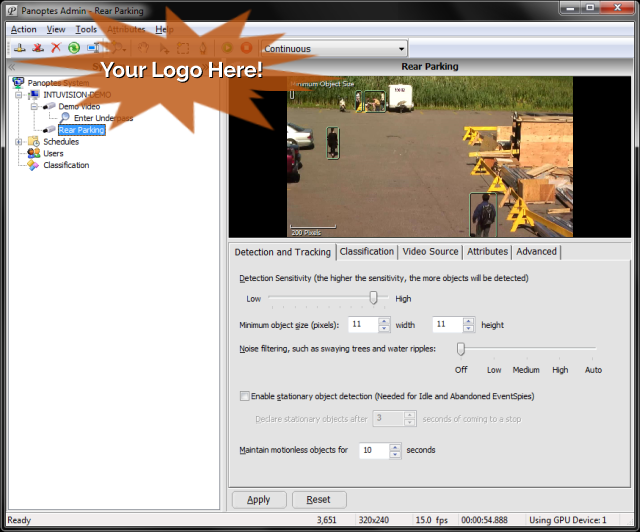 The intuVision VA system is split into two components through which users can add video streams or files to analyze, control object and event detection settings, and monitor events. The intuVision VA Admin performs tasks specific to administrators, while the intuVision VA Monitor allows for efficient camera and event observation. The intuVision VA Admin (below) is used to add and configure new video sources (from live camera or from file) and to create event spies. The intuVision VA system is preconfigured for quick start up times, but is also highly customizable for optimal results over a wide range of event scenes. In most deployments, you will only need to adjust 1 or 2 settings before adding your events. In more challenging scenes, we still give you access to advanced settings, so you can achieve optimal detections. 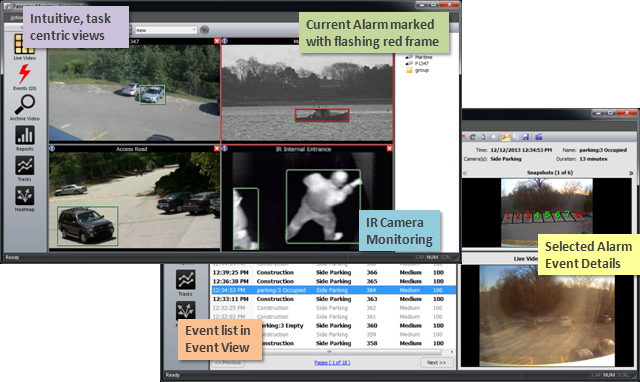 The intuVision VA Monitor is the client application, used to watch the activities of tracked objects, camera views, and the processing and event detection results. Many different options for the camera display are available, including the capability to set up touring camera groups. Intuitive task centric views let you easily accomplish tasks, such as event review, searching for events, reviewing archived video, generating reports, searching and reviewing tracks, and generating heatmaps. While different tasks will be used more for different types of deployments, the functionality is included to allow you to get the most from your processed video. Review your live video at a glance, with the ability to include up to 48 cameras in one camera layout, see the event zones over-laid on the live video, see up-to-date counts and flashing indicating unreviewed events on that camera. Optionally, give your users the ability to pause processing and add privacy masks from this application for a preset duration. Access and review events detected by intuVision VA. You will see the list of events, when one is selected, you can see the event snapshot and event details, along with the live video of that camera. Events can be deleted, flagged, or acknowledged, including the ability to add event descriptions. Optionally, events and event snapshots can be exported and shared. Events can be searched according to a variety of properties, including classification type, schedule, camera, event, and time period. The filtered events can be reviewed, with the event snapshot and event details available. Events can be exported as a CSV for further event analysis in other programs. intuVision VA can either archive video for you or can ingest archived video from one of our VMS partners. Search for the video duration of interest, and view the events only summary. Events from multiple years in the past can be used to generate reports. Typically used in retail or traffic domains, this feature can also let you compare events this year vs. previous years to show efficacy of new security measures. Events are displayed in a variety of attractive charts and are ready for export and to be shared with decision-makers. Unforeseen occurrences sometimes occur, and tracks can be saved and searched after the fact for specific events or instances. For instance, you are using intuVision Retail primarily for people counting and for heatmaps, but you determine that there has been a suspicious incident, and you get a tip that the person was wearing a red sweatshirt. Object tracks can be searched by time, date, camera, location, classification type, and color - and then reviewed in an easy list. If video archiving has also been enabled, you can view the video associated with this person. Using heatmaps, users can see the accumulated travel information over a selected period of time. As more objects travel on a path or pause for various durations, the heatmap reflects these actions. Used in a traffic scenario, users can tell at a glance where the bottlenecks are and can change the traffic light patterns accordingly. Similarly, in a retail environment, users can tell at a glance which sale items attract the shoppers’ attention and which paths are most commonly travelled.